This article will delve into the performance potential, and practicality of modification for the QR25DE. Although this engine is in the Sentra, Rogue, Altima and a few other models, this is focusing on the Sentra Spec-V.
At the heart of every great Nissan is a powerful engine. Nissan powerplants are consistently high-quality and brutishly overbuilt, leaving copious headroom for power-hungry tuners. Strong Nissan powerplants are something of a tradition, going back over 30 years to the stout L-series in the 510 and 240Z. In recent years, of course, the SR20DE has been the Nissan tuner’s canvas of choice, offering the potential for extraordinary horsepower, despite what might appear to be average performance in stock form. With this strong tradition, the arrival of a new Nissan powerplant is cause for celebration, and just a little trepidation. Experience is the fertile soil in which horsepower is grown, and the SR20DE benefits from 10 years of tuners’ trial and error. With the new QR25DE, all that accumulated knowledge is gone. With that in mind, we took an especially close look at the new engine to help jump-start the learning process. The QR25DE was designed to eventually replace both the SR20DE and the KA24DE used in the Altima. To succeed in this dual role, it had to be light and powerful like the SR20, and fuel efficient and torquey like the KA24DE. Lightness was achieved by using a thin-wall die-cast aluminum block. Both the SR20 and KA24 were sand cast, which essentially means an engine-block-shaped cavity is carved out of sand before molten aluminum (or iron in the case of the KA24) is poured into the hole. Sand blanks used to form complex internal structures like the water jackets are then washed out, leaving the completed part. Sand is not a very precise material, so sand-cast parts have to be made extra thick to allow for shifting of the blanks. Sand casting’s big advantage is it can be trapped in place and then washed out, allowing tremendous flexibility for making strange shapes. Die casting means the block is formed by pouring molten aluminum into a metal die. The die is far more precise, allowing for a thinner final product, but since the die has to be pulled off as a solid piece, the water jackets have to be open on top. The end result is an open deck design like most modern Honda and Toyota engines. Open deck blocks are lighter, offer better cylinder temperature control, and because the cylinders don’t warp when the head bolts are torqued, they are easier to bore perfectly round. The downside is they can be fragile when pushed far beyond their design limit. Excessive cylinder pressure can cause the bores to shift ,or in the worst case, crack. The solution is to weld in an insert that connects the top of the bores with the external block structure, or to integrate that structure into a new cylinder liner. While there are many advantages, the open-deck design of the QR25 may make truly extreme performance one step more difficult. The net result of this thin-wall construction, however, is light weight. Despite its larger displacement, the new enigne is 13 percent lighter than the SR20DE and over 20 percent lighter than the KA24DE. Compact construction means it’s also 30mm shorter than the SR20. The 2488cc of displacement is achieved with a relatively small 89mm bore and a huge 100mm stroke. For reference, the SR20 uses an 86mm bore and 86mm stroke, and Subaru’s 2,457cc EJ25 uses a huge 99.5mm bore and a much shorter 79mm stroke. The relatively small combustion chamber from the 89mm bore makes emissions control easier, and the long stroke helps achieve the torque goals. The connecting rod is 163mm long, giving a 1.63:1 rod/stroke ratio. Looking closely at the piston, you can see the gap between the first and second compression rings is very big. The oil control ring and the second compression ring are both in the conventional location, but the top compression ring has been moved higher to reduce the volume of gasses trapped between the cylinder wall and the piston above the top ring–a common source of hydrocarbon emissions. This does make the ring land (the piston material above the first ring) thinner and possibly less resistant to the pounding of detonation. That’s just one more reason to tune carefully when you turbocharge. A four cylinder this big will tend to have obnoxious secondary vibrations. To eliminate this, the QR25 is fitted with twin, counterrotating balance shafts mounted in the top of the oil pan directly under cylinder #1. The balance shaft spin at twice the speed of the crankshaft, but this, in itself, does not limit the safe rpm limit of the engine. The balance shafts themselves would be safe spinning past 20,000 rpm, according to the QR25’s lead engineer, Shunichi Inamijima. The rest of the engine may fly apart, but the balance shafts would be fine. The crankshaft, in standard Nissan practice, is forged for maximum strength and micropolished to minimize friction. Instead of a main bearing bridge like most SR20s use, the block is split at the crank centerline and the five main bearings are incorporated into the bottom half of the crankcase. This has become fairly common practice, and is generally considered to be the most rigid way to construct the crankcase. The number 1, 3, and 5 main bearing caps are iron, while number 2 and 4 are aluminum. The iron caps are cast in place in the aluminum lower crankcase. Up top, air enters through a drive-by-wire throttle body. Instead of a throttle cable, there is simply a sensor on the gas pedal and a small motor on the throttle plate. Between them is the computer, and like many drive-by-wire systems, there is no direct relationship between your foot position and the throttle position. Push down 50 percent on the pedal, for instance, and the ECU will open the throttle the appropriate amount to give you 50 percent of the torque available. That may mean a 30 percent throttle opening, or it may mean 80 percent, but you’ll never know. Interestingly, although the rev limiter could be implemented by simply having the ECU close the throttle (as Porsche does), that was deemed too smooth, so the rev limiter is done conventionally, by shutting down the fuel injectors. Being drive-by-wire in itself doesn’t make it any harder to reprogram the ECU, but it does make the consequences of tripping over the wrong bit much bigger. Since the ECU is completely new, it will probably take a few years for anyone to crack it. The intake manifold is a thin-wall aluminum casting and is equipped with dual intake runners. A longer one for low-rpm use and a shorter one that opens up at high rpm. The switchover happens at around 5000 rpm–surprisingly high, considering the low redline. The fuel injectors are now a conventional top-feed design but the fuel rail is somewhat unique for its rectangular cross section. The long, flat, unsupported wall of the fuel rail is designed to be slightly flexible so it can act as a pulsation damper. Previous Nissan engines had to use a separate pulsation damper mounted to a round fuel rail. The fuel system is returnless, like most new cars, to lower the temperatures of the fuel in the tank and minimize evaporative emissions. Fuel pressure does not vary with manifold pressure as it did with the old engines; instead, it is now fixed at about 50 psi. This means no tuning simple turbo systems with rising rate fuel pressure regulators… sorry. For ignition, the antiquated distributors of the SR20 and KA24 are finally gone, replaced with a compact coil on each spark plug. No more pretty spark plug wires, no more ignition upgrades, no more easy horsepower by advancing the distributor. The 32-tooth crank position sensor now used to reference the ignition timing is built into the back of the crankshaft to help shorten the engine by a few millimeters. It is not adjustable. A lot of work went into minimizing friction in the valvetrain in an effort to maximize fuel efficiency. Minimizing valvetrain mass allows the valve springs to be lighter, which reduces the amount of power wasted opening valves. To achieve minimum valvetrain mass, a direct-acting cam-on-bucket design is used. Unlike most direct acting valvetrains, there is no valve shim for adjusting valve lash. Instead, the entire bucket is available in different thicknesses when valve adjutments need to be made. Elininating the shim further reduces valvetrain mass. 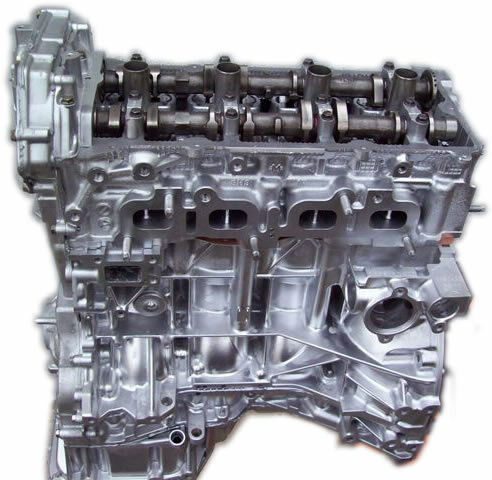 Valve adjustment isn’t likely to be necessary during the normal service life of the engine because of the very light valve springs, but changing cams will likely require valve springs and a more complex adjustment procedure than the hydraulically adjusted SR20, or the screw-adjusted Honda engines. The cam lobes themselves are also extremely narrow (much like Toyota’s high-efficiency 1ZZ-FE engine) to minimize friction, and the base circle is narrower still. The relatively small cam wiping pad offered by a direct acting valvetrain limits how aggressive the cam profile can be. By comparison, the larger pad available on a rocker arm like those in the SR20 or any Honda engine allow higher specific output. VTC variable cam timing is used on the intake cam. (The activator cam on the front of the engine can be seen in photo #8.) At the current state of development, the intake cam can be advanced or retarded over a 37 degree window, though the range of adjustment may change with the final engine calibration. Because valve overlap can be used to control internal exhaust gas recirculation, no EGR valve is used. That simplifies the engine and keeps the intake manifold free from flow-clogging soot. Finally, the exhaust manifold. No surprises here, the catalytic converter is nestled up close to the engine to ensure that it reaches operating temperature as quickly as possible. Making the best of a bad situation, Nissan uses a tubular, stainless-steel 4-into-1 header to feed this close-coupled cat. The manifold looks about as good as it can, given the circumstances. Most of the points we noticed on the engine seemed negative, from a pure performance standpoint, but we still come away encouraged. Weaknesses like the thin ring lands and open block deck are only important at extremely high specific outputs. The point that is easily lost about the QR25 is that it is HUGE. Two and a half liters is a lot of displacement, and you don’t have to lean on it very hard to get big power. Stock output is 180 hp at 5800 rpm, and word from inside Nissan is there is at least 10, and possibly as much as 20 hp bound up in a restrictive exhaust system. Beyond simple intake and exhaust mods, a light-pressure turbocharger or supercharger seems to be the obvious route for horsepower. Camshafts will be expensive because of the requirement for valve springs and different buckets to maintain proper lash adjustment. Five psi of boost on top of 2.5 liters, however, should make a lot more power and shouldn’t cost any more than they would on any other engine. What do you know; maybe the V8 boys had a point about displacement.